Join us and fellow unicorns for an interactive discussion featuring two of Unicorns Unite’s authors: Jane Leu and Jessamyn Shams-Lau. 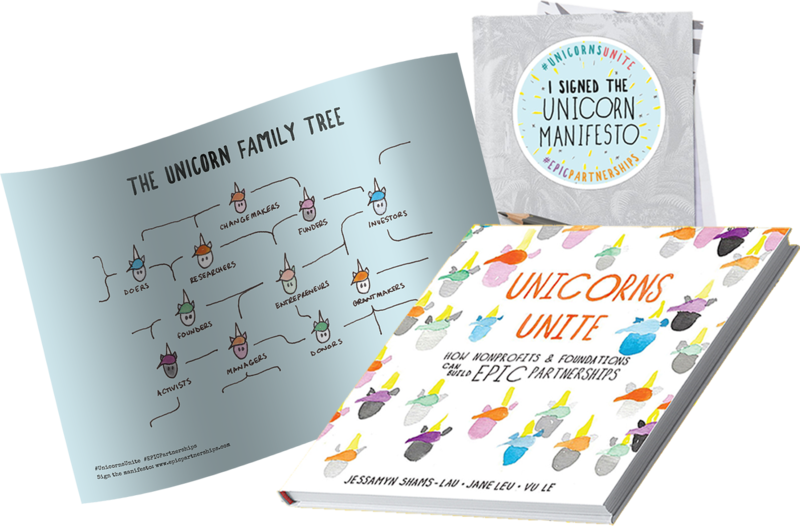 Unicorns Unite is a playful, whimsical journey through a challenging conversation about the way foundations and nonprofits relate today, and why we're stuck in the status quo. You will hear from the co-authors, engage with them in Q&A and do interactive exercises with your fellow unicorns at Unicorn Unity parties around the country. The book and this event are all about celebrating our common identity as 'unicorns' – for changemakers of all kinds, fundraisers and funders - based on our pride in our hard work and shared aspirations for a vibrant, thriving planet and communities. The book helps unicorns dream up a better future of EPIC Partnerships and take steps to make them happen. This event leads unicorns through a series of exercises and highlights more from the book that they can do and discuss with teams, partners, and boards. Join us for a few inspiring, FUN and thought-provoking hours of Unicorn Unity! Jane and Jessamyn will be at the Foundation Center West in San Francisco and broadcasted live to unicorns gathered in person in select cities. Come to the event in your city or join us online from wherever you are in the US or world! Register Now! Space is Limited. Free. Find Your Nearest Location and Register Today! Host your own Watch Party from anywhere in the world! Just email us and we'll send you all the details and materials you'll need to make it happen! Head over to our e-store and get your hands on some sweet Unicorns Unite swag to show off your Unicorn pride! © 2018 Unicorns Unite. All Rights Reserved.